On September 16th, 1810, Miguel Hidalgo y Costilla, a priest the town of Dolores, Guanajuato, rang the church bell to gather the townspeople. He called for the people of Mexico to rise up against the Spanish Crown, thus initiating Mexico's War of Independence. Factually, the country did not achieve independence until 1821, but it is this event, known as the Grito de Dolores which is commemorated every year in town squares across Mexico. Today, and into the weekend, you will see a variety of people waving the Mexican national flags and having all sorts of other related activities occurring as a result of the celebration. Here in Playa, the Independence Day celebration takes place in the Plaza of the municipality, which is decorated from the beginning of September with red, white and green lights and Mexican flags. 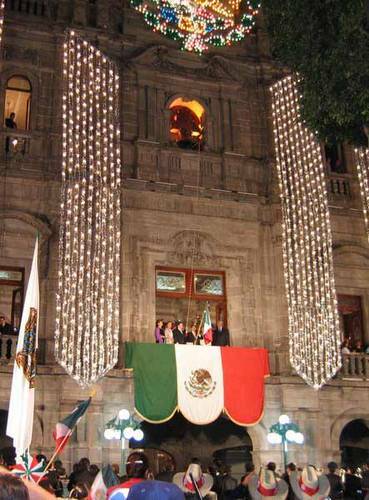 On the 15th, at 11 pm the President of the Playa del Carmen goes out onto the central balcony of the Palacio, rings the bell (like Miguel Hidalgo rang in 1810), and cries to the people gathered in the square below, who enthusiastically respond "¡Viva!" The celebrations continue on the 16th with civic ceremonies and parades in the principal avenues of Playa del Carmen, were children of different school participate. The Spirits will be high. The people have earned their sovereignty equally as much as the USA. With that responsibility, Mexico has developed into what it is today based of character it has earned through the challenges that befall any nation. Today is a day of observing this fact, and is a good time to learn and appreciate more of the unique dynamics that have gone into Mexico Today.